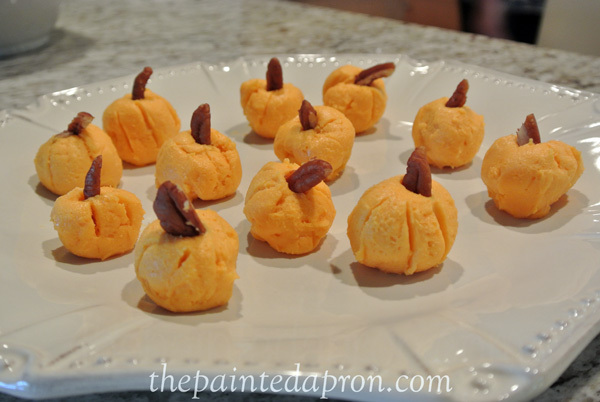 Need some last minute goodies for some Halloween fun? 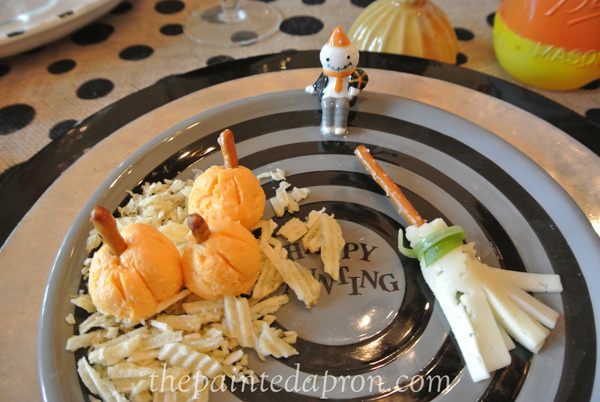 How about some cheese pumpkins or a cheesy broom? 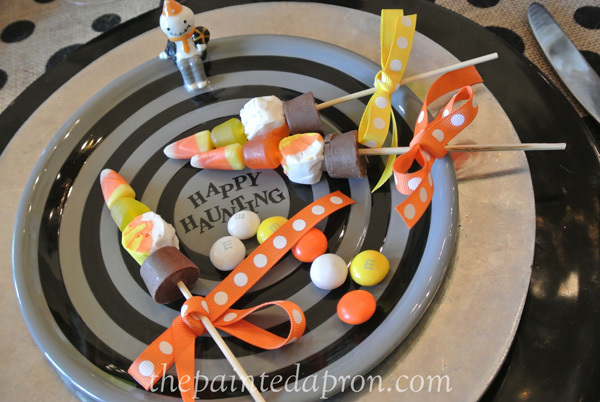 Halloween sweet kebobs or a jar full of treats? Nothing labor intensive at this point, just fun! Nestle them in some “potato chip hay” Potato sticks really look better but I forgot to buy some. The broom looked easier that it was! 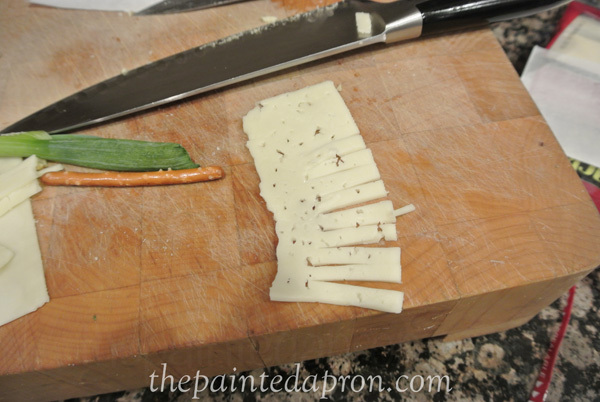 My cheese kept falling apart and it is pretty hard to tie a green onion tightly around crumbly cheese. I managed to eek out one little ole broom to impress you with. If you want to see how it’s done by a much more patient person, check out professional looking brooms here. 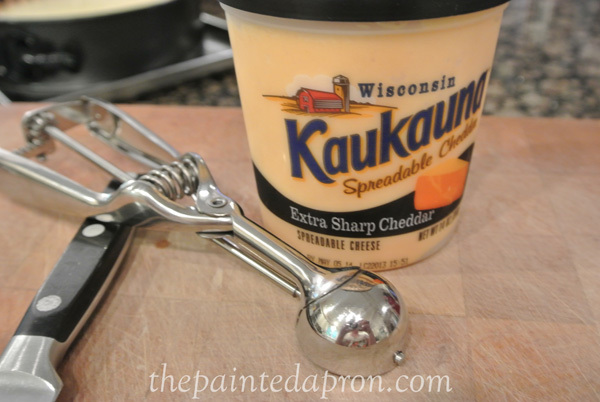 I don’t know what kind of cheese they used, I tried Havarti and sharp white cheddar slices and struggled! Sometimes I don’t trust Pinterest, just sayin… have you ever tried something that looks easy and fabulous in the photos and had a massive flop? I have, plenty of times! So just wanted to give you the truth about my broom experience! 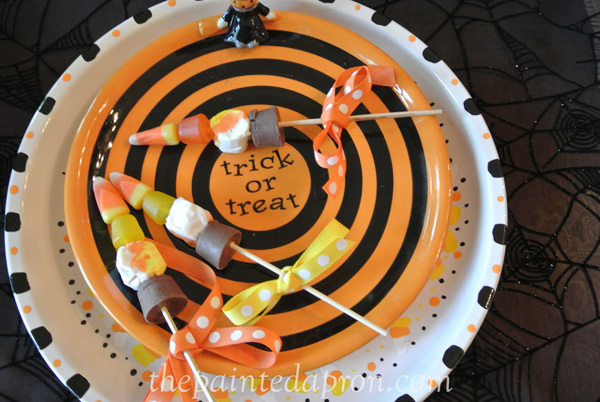 I didn’t have buckets of cute Halloween candy, we don’t get but a handful of trick or treaters and my grands aren’t allowed to have much so mostly I use candy to decorate with~ I did have a few things though so decided to make some mini treat kebobs. 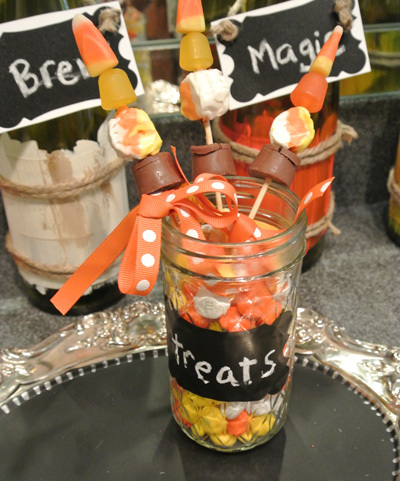 A simple jar filled with candy makes a great treat too~This one is full of candy corn M&Ms. A chalkboard label for the front and a cupcake paper lines the jar lid, and this treat is ready to travel! Wishing you lots of Halloween fun! And jars full of delicious treats!! 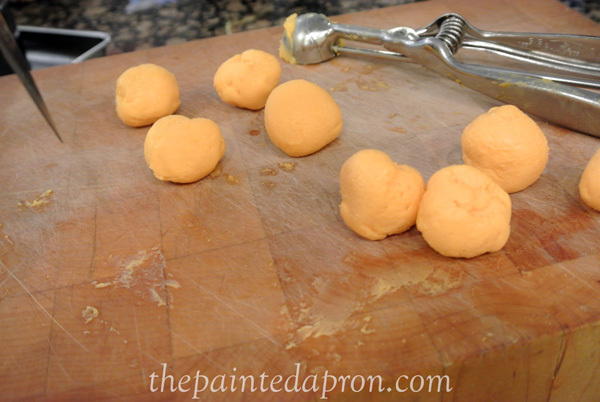 ← Recipe Box, Craving Pizza? Oh yes, had more than my share of “not so pretty” recipes in the kitchen! Like you we don’t do a lot of sweet treats but I have a few up my sleeve to share with my grandson, on the sly too! I think all of your treats look fabulous, love the skewers of treats and your great idea for “potato chip hay”. 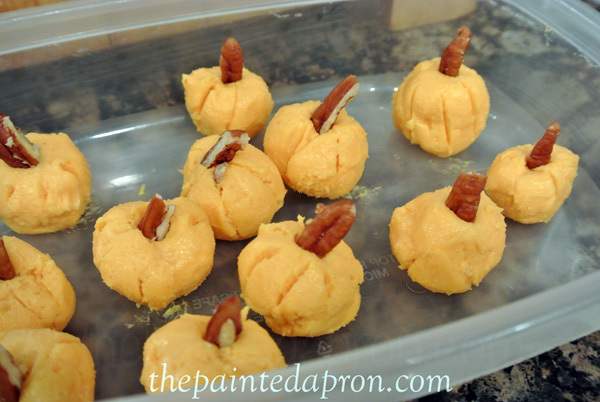 Great Halloween treats……….. I love all of your fun food! 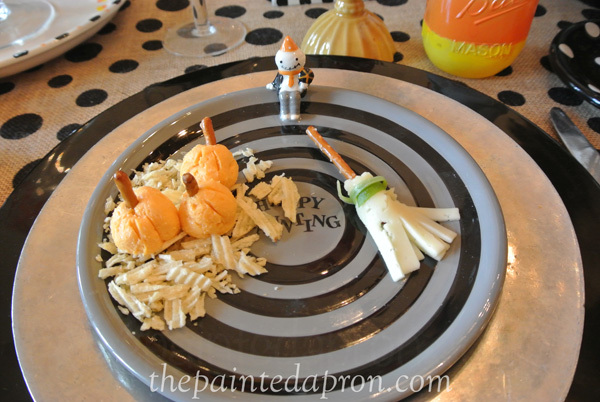 We are having a family Halloween dinner and I definitely will be making the pumpkins! We did the kebabs the last two years but I never thought to put chocolate on them – silly me! I will be adding your idea too! What fabulous plates! They just set the food off so well. Where did you get them? I ordered the plates from Amazon.com a couple of months ago, they were my splurge for the season! Thanks Jacqueline! All of these are so cute Jenna!! 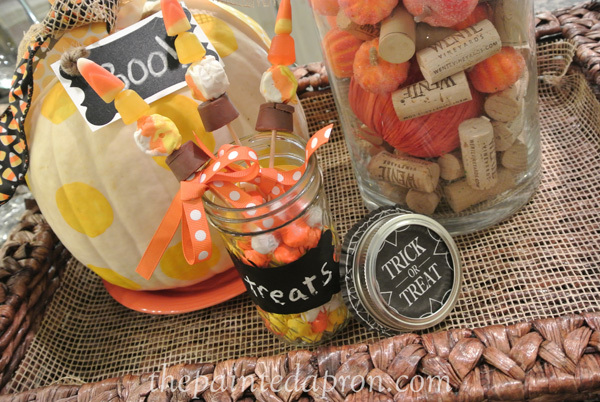 Love all of these fun ideas! You are so gracious Mary, you realize of course your fabulous candy skewers were my inspiration~ I love your term “pintrosity” ha ha! Perfect! All of your treats look fabulous. I really like the little kabobs. I sure understand what youmean about the brooms. Many years ago I made them with fruit leather, basically fruit roll ups. It was a lot of work. These are soooo cute! 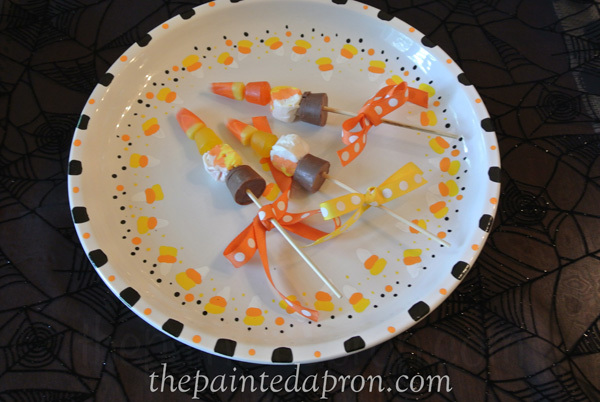 I have to make the candy kebabs for my kids–they would love these! Fun Food! I love them- the witch broom is so cute 🙂 Thank you so much for linking up to Get Your DIY On this week with your pumpkins! I hope you’ll join us tomorrow at 7pm Est with any Burlap projects!